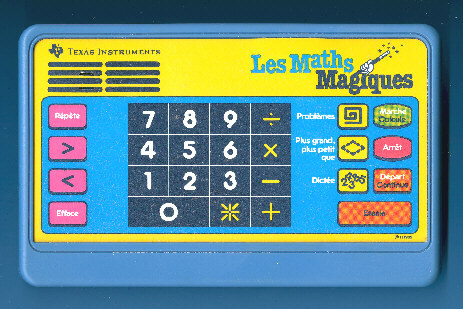 Size: 5.3" x 8.5" x 1.5"
At first glance this rare Les Maths Magiques sold in France seems to be a variation of the Speak & Spell Compact and its sibbling Speak & Write. But the keyboards of these two products type the characters "A"..."Z" while the Les Maths Magiques reads the numbers "0"..."9" like the original Speak & Math introduced already in 1980. Actually we discovered the the unknown "Speak & Math Compact" sandwiched between the original Speak & Math and the le Calcul magique introduced in 1986 and using much simpler technology. Dismantling the Les Maths Magiques reveals indeed the technology of the Speak & Math / Speak & Spell products. © Joerg Woerner, July 12, 2005. No reprints without written permission.